Leading presidential candidates take part in Transparencia's April 3 debate at the Marriot Hotel in Lima, Peru. We are pleased to welcome Groupe d'Intervention en Affaires Publiques (GIAP); Poder Cuidadano; Centro de Implementación de Políticas Públicas para la Equidad (CIPPEC); and the Trinidad and Tobago Debates Commission to the network. We look forward to sharing updates from old and new members as we go forward. International Debate Network members from Colombia, Peru and the U.S. with leaders of the Argentine debates coalition Poder Ciudadano and CIPPEC. The Argentine public policy think tank, the Center for the Implementation of Public Policies for Equity and Growth (Centro de Implementación de Políticas Públicas para la Equidad, CIPPEC), and the good government watchdog group, Citizen Power (Poder Ciudadano), formed a coalition to organize debates at the presidential, provincial and municipal levels for elections that took place in July and will continue through October. Their initial effort to hold a debate in July for the municipality of Buenos Aires was unsuccessful when the leading mayoral candidate, ahead by a wide margin in the polls, declined to take part in a debate before a July runoff election. Undaunted, CIPPEC moved ahead and organized a debate among candidates for the governorship of Buenos Aires, a key province that includes some 40 percent of the national electorate. The debate focused on one politically sensitive issue — the distribution of national revenues among the provinces. Poder Ciudadano also moderated a debate on environmental policy among candidates for the legislature of the city of Buenos Aires and is organizing a debate on the future of executive and legislative branch relations for candidates for the National Congress for the Buenos Aires district. In addition, Poder Ciudadano and CIPPEC are organizing the first municipal debate in the city of Morón, one of the largest districts in the Buenos Aires province. The groups are continuing their work on a possible presidential debate before the Oct. 23 elections, which would be a historic first for Argentina. In June, four members of the International Debates Network traveled to Buenos Aires to exchange ideas and experiences with CIPPEC and Poder Cuidadano. Representatives from Pro Cartagena Civic Social Foundation (Fundación Cívica Social Pro Cartagena, FUNCICAR) of Colombia; Transparency (Transparencia) of Peru; the Commission on Presidential Debates (CPD) and the National Democratic Institute (NDI) from the U.S. took part in the exchange. Transparencia's May 29 debate between runoff candidates Keiko Fujimori and Ollanta Humala. International Debates Network member Transparencia organized several widely watched debates for this year's presidential election in Peru. The group organized a debate for the top five candidates in the first-round election on April 9. Transparencia also organized a debate between key policy advisors of the candidates. Before the June 5 runoff between Keiko Fujimori and now-President Ollanta Humala, Transparencia organized a debate in collaboration with the National Elections Board (Jurado Nacional de Elecciones, JNE), the think tank Consortium for Social and Economic Research (Consorcio de Investigación Económica y Social, CIES), and NDI. The debate was estimated to have been seen or heard by 52 percent of Peruvians. CNN/Español also broadcast the event live across the region and projects that the debate was seen in nearly 30 Latin American countries and the U.S., potentially reaching 27 million viewers outside Peru. Nigerian President Goodluck Jonathan at the March 30 debate in Abuja. Photo: The Hill. After months of planning and the endorsement of election authorities, the Nigerian Elections Debate Group (NEDG), a coalition of 13 media, civic and professional organizations, staged a series of presidential and vice presidential candidate debates among the eight leading political parties in March. Incumbent President Goodluck Jonathan participated in a debate although the leading opposition parties boycotted the event citing, among other reasons, the president's absence at an earlier debate sponsored by the cable network NN24. The candidates, in debates with up to four participants, took questions about governance, corruption, education, national security, housing, gender and other major issues based on questions emailed to the NEDG ahead of the events. The debates were aired on Nigerian Television Authority, Africa Independent Television, Channels television and Radio Nigeria for an estimated total audience of 50 million people across the country. An online discussion also drew in almost 900 comments and questions from viewers on the candidates' responses and the merits of debates. In addition to support from NDI-Nigeria and Washington, D.C. staff, CPD and JDC representatives traveled to Nigeria's capital before the debates to discuss the NEDG plans. The CPD and JDC also took part in a national forum on debates with 120 representatives of political parties, media and civil society, which helped build support for the debates. Television production experts from ORTN review options for a debate "traffic light" to help candidates keep to time limits. Following the first round presidential election in January, the National Communications Observatory (Observatoire National de la Communication, ONC), a state media regulatory agency, planned to organize a presidential debate between runoff candidates Seini Oumarou and Mahamadou Issoufou. In the lead-up to the first round election, the ONC had asked all 10 candidates to commit to participate in a final debate, should they make it to the second round. Seven of the 10 candidates, including the eventual finalists, signed the pledge. Three days before the planned March 10 televised debate, Seini Oumarou withdrew citing campaign scheduling conflicts. The debate was canceled. Despite this setback, ONC leaders plan to continue to promote a culture of debate in their country. In addition to support from the NDI-Niger staff for the debate, members of the International Debates Network, including the CPD and JDC, visited Niger's capital Niamey and shared ideas with the leadership of the ONC as well as production experts at the Office of Radio Television Broadcasting of Niger (Office de Radiodiffusion Télévision du Niger, ORTN), where the debate was to be recorded. 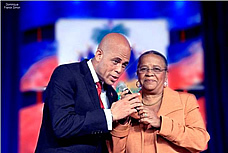 Michel Martelly and Mirlande Manigat encourage Haitians to vote. On March 9, the Public Affairs Intervention Group (Groupe d'Intervention en Affaires Publiques, GIAP) organized a debate for the March 20 runoff election between presidential candidates Mirlande Manigat and Michel Martelly. The debate was a highlight of an otherwise problematic election process. The candidates debated four topics: security, post-earthquake reconstruction, economic production and plans for their first 100 days in office. According to the National Haitian Media Association, this final face-off, broadcast nationally on more than 30 radio and television stations, reached an estimated 71 percent of Haitians. This figure exceeded the audience for Haiti's most popular television programs and was only surpassed by the final round of the World Cup. GIAP also facilitated a highly-publicized joint appearance by both candidates at the end of the debate encouraging Haitians to vote. Debate moderators from each of the cooperating broadcasters greet candidates at a Sept. 30 state-level debate. Before voting in the Oct. 3, 2010, general election, Bosnians tuned in to watch candidates in three national debates. Organized by NDI with Bosnian partners, the first debates took place in Banja Luka on Sept. 16, featuring the parties most popular in the Republika Srpska. It was followed by a debate in Mostar on Sept. 23 with parties ranked highest in the Federation of Bosnia and Herzegovina and one in Sarajevo Sept. 30, showcasing parties from both of Bosnia's political entities in a relatively rare joint policy discussion at the national level. The debates represented an important example of constructive and collegial political dialogue in an electoral campaign dominated by ethnic divisions. The CPD continues preparations for presidential and vice presidential debates for the 2012 elections. Twelve universities have applied to host debates and CPD staff are surveying each of the sites. The final list of debate venues will be announced in the fall. "No Less Than Four Presidential Debates"
"Donald Ramotar Says He Is Ready for Public Debate Anytime, Anywhere"
"For Kenya's Sake, Candidates for the Presidency Should Hold Public Debates"
*Articles do not represent the views of the CPD or NDI. This newsletter is made possible by the generous support of the American people through the United States Agency for International Development (USAID) under CEPPS Leader Award (LWA) Cooperative Agreement No. DFD-A-00-08-00350-00. The opinions expressed herein are those of the author(s) and do not necessarily reflect the views of USAID of the United States government.